I know you’re probably thinking that you wouldn’t ever be able to afford one of the new robot vacuums? Whenever new technology comes around it tends to be priced out of range of the everyday family. 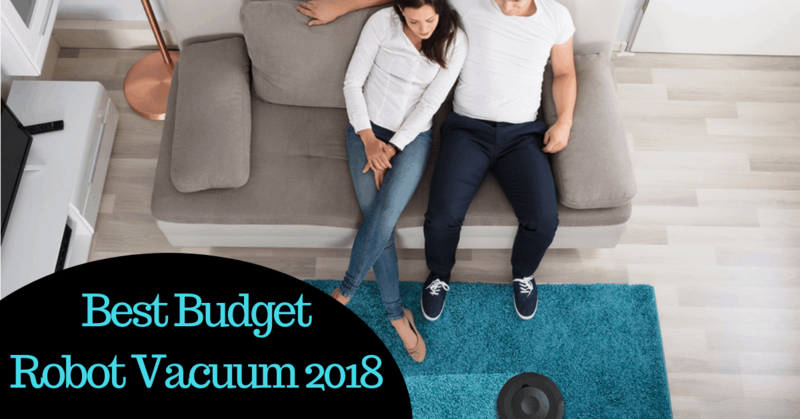 Today I’m going to be showing you some cheaper options that are now available and what I think is the Best Budget Robot Vacuum 2018. There are a few other alternatives so you can see what else you can get for your money if you go to the cheaper end of the market. it is selling for a reasonable price but also gives you a good cleaner for any type of floors. In fact all of our choices here come in under $300. The Roomba 690 is one of the latest upgrades from iRobot, they have taken the Roomba 650 and improved the battery and added wi-fi and voice integration so you can use this with Alexa. This isn’t the cheapest robot vacuum so why do I recommend it as the best budget robot vacuum 2018? What I’ve looked at is the features you get and the vacuum capability with the price charged and this has it all. The Roomba 690 like all Roomba vacuums has a strong motor which can give good suction whether you are on carpet or hardwood floors and it comes with 2 brushes underneath that will pick up everything including pet hair. It will run for up to an hour before taking itself back to the dock to recharge. You have the option to set up a daily schedule using the app so that you can set it and forget it when it comes to the cleaning although you will need to empty the dustbin on a daily basis if you have a lot of pet hair being picked up. You can just send it to clean manually using your phone if you don’t want the scheduling or set it up with Alexa and just tell it to clean. is pretty easy with just the bin to empty, the filter to tap clean into your rubbish bin and to check the brushes and wheels for a build up of hair which could affect it’s efficiency. It does clean in a random fashion but is surprisingly effective at cleaning the floor. Why not check it out today. both come in less than $250 and offer a good alternative to the Roomba. The Eufy is a bit slimmer than the 690 at 3.1 inches high to 3.6 for the Roomba. doesn’t have any wifi control, what it does have is a remote control which you can use to set up scheduling if you want it and to manually send the vacuum to clean the room. It has an automatic cleaning mode, a spot cleaning mode, a max mode which is helpful if you are cleaning carpets and an edge cleaning mode. It can clean all floor types but it’s not meant to clean high pile carpets or dark floors, hard floors no problem and thinner carpets. has a rotary brush underneath,2 side brushes and strong suction for picking up dirt and hair and it has a cleaning time of around 1.5 hours on one charge before it will return to the dock to recharge. It has a full range of sensors to allow it to move around without banging into the furniture or falling down stairs. It cleans in a random fashion which is not the most efficient way to clean but does seem to work well anyway. Click on the link below to check it out. is a combination vacuum and mop. This doesn’t have any wifi connection but does have a remote control and can be scheduled to clean automatically. With the dust bin attached you can vacuum the floor using 3 modes, auto clean which automatically cleans in a random movement. You have spot clean to deep clean on a dirty area or edge clean to clean along the wall sides. There is no brush underneath just 2 spinning side brushes and suction although a brush isn’t required as much on hard floors. for the water tank and clip on the mop attachment and send it to mop the floor. Make sure that it doesn’t go back to charge with the water tank in it as that isn’t recommended. It’s only 3 inches tall so can fit under furniture quite well and it has sensors to stop it from hitting objects or falling downstairs. If you think this is more your type of robot click the link below to check it out. is another wifi controlled robot vacuum that has been upgraded from the Ecovacs Deebot n79. You can do everything you need to via an app and you can also integrate with Alexa if you have an Amazon Echo device. Don’t worry if you don’t like wifi it does come with a remote control too. This robot vacuum comes in under $250 and is best for hard floors and thin carpets. It has 3 stage cleaning which is a helix brush underneath the unit, 2 side brushes and suction to clean your floors and it does have 4 cleaning modes which are AUTO which cleans randomly around the room changing direction as it encounters objects, SPOT which is great for spills or specifically dirty areas, EDGE if you want it to concentrate around the edges of your room and SINGLE ROOM for cleaning a room at a time. You also have a MAX option for greater suction. gives over 100 minutes of cleaning time before it returns to recharge and it runs very quietly. Definitely worth checking out. Last but by no means least we have the Housmile Robotic Vacuum Cleaner. This vacuum is currently selling for under $100 so let’s see what one of the cheapest options can offer. is better for homes with hard floors or thin carpets because it doesn’t have a brush underneath only 2 side brushes and suction. You don’t have any wifi or remote control on this machine and the controls are manual with the button on the top. There are 2 cleaning modes, small room mode which is 30 minutes cleaning and large room mode which is 60 minutes cleaning. You don’t get a docking unit with this robot vacuum either, to charge you remove the battery and charge it with its charging unit. The vacuum is only 3.1 inches high and does have bump sensors and drop sensors so it will manage it’s way around your furniture and not fall downstairs. This is just a basic robot vacuum but for the price it will do what you need to clean your floors. Check it out using the link below. If you are on a tight budget there are options for you in the robot vacuum world. We think the Best Budget Robot Vacuum 2018 is the Roomba 690, it works on all flooring, has great suction and cleaning ability and would fit well into your smart home if you’re into voice control set ups. There are other options though so check them out above and find something that will work for you.